It is Father's Day this Sunday in the USA and to celebrate we are presenting some wonderful family images. Firstly, 33 gay male parented families that just happen to be famous US (mainly) families. Check them out at the Advocate here. 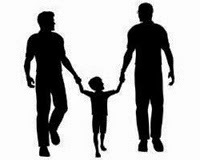 Secondly, 30 gay male parented families from Australia. Regular, non-famous guys and their kids. Showing the diversity and beauty of our families. These families are all part of the Gay Dads Australia "Awesome Aussie Gay Dads" project.